‘Save the Date Fridge Magnets’ are a perfect way of ensuring that your friends do not forget your special day. Whether it is a night out, a christening, a birthday party or a wedding that you are inviting them to, it is important that they don’t forget. Every house has a fridge and everyone will open the fridge door on a daily basis. So there is no better location for you to put your message. Our fridge magnets are based on a 57mm badge, and have a magnet on the back. This means that can be safely attached to any metallic objects. Perfect for attaching to a fridge and getting your message seen on a daily basis. 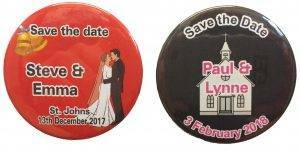 We have a range of designs for weddings, and of course our range of hen night badges and birthday badges can also be supplied in a magnetic fridge magnet format. Just look at the various design under hen nights or birthday badges. Then just let us know what you require. You can order on line if you can see the design that you require. Just let us have the details of your special wording. If you would like to modify the design or add a photograph or adapt a badge from our birthday or hen night range then just pop the details on an email and we will respond within a few hours to let you have a quote. Customising a design from another category of badges doesn’t usually affect the price. Make sure that your party or special occasion is not forgotten. 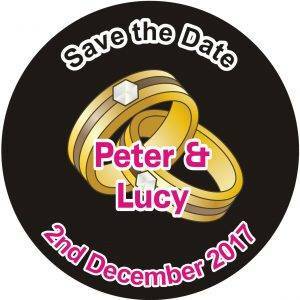 Contact us today and choose a design for your very own personalised ‘save the date badge’. You can also arrange for a matching set of badges or rosettes for your hen night or actual birthday party.